The new word hraimuashing entered our minds and dictionaries in a phenomenally short time. This sinister political expression had never been seen in print anywhere until a few years ago. A bout the only times it was ever heard in conversation was inside a tight, intimate circle of trusted relatives or reliable friends in Red China during the short honeymoon period of communism. The few exceptions were when a Red indoctrinator would lose his temper and shout out, You need a brainwashing. The reason the word was picked up so quickly was that it was not just a clever synonym for something already known, but described a strategy that had yet no name. A vacuum in language existed: no word tied together the various tactics that make up the process by which the communists expected to create their new Soviet man. The word came out of the sufferings of the Chinese people. 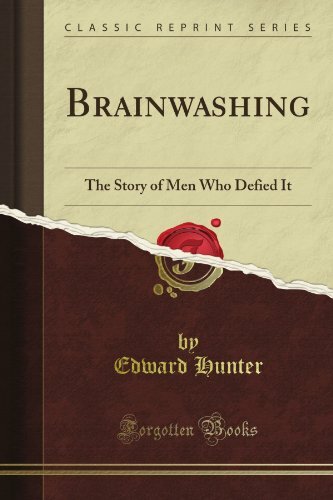 Put under a terrifying combination of subtle and crude mental and physical pressures and tortures, they detected a pattern and called it brainwashing. The Reds wanted people to believe that it could be amply described by some familiar expression such as education, public relations, persuasion or by some misleading term like mind reform and re-educa- tion. None of these could define it because it was much, much more than any one of them alone. The Chinese knew they hadnt just been educated or persuaded; something much more dire than that had been perpetrated on them, similar in many peculiar ways to a medical treatment.